Juicy, sweet & tangy. A great tasty snack anytime of day. A source of fibre. Free from artificial colours, flavours and preservatives.Deliciously sweet & tangy, Craisins®dried cranberries are so plump & juicy. They really hit the spot when you need something satisfyingly sweet to nibble on. What's more, they contain fibre, which is satisfying too! Our family of growers nurture and pick only the very best cranberries to bring you these tantalising fruity bites. 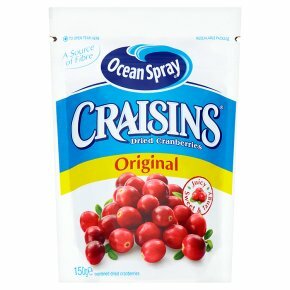 So whenever you want a quick & tasty snack or to add something fruity to your food, grab a bag of Craisins®dried cranberries. We hope you enjoy them as much as we do! A 40g serving of Ocean Spray®Craisins®dried cranberries had the same fruit content as 240ml glass of Ocean Spray®Cranberry Classic®juice drink. Enjoy Craisins®dried cranberries in salads, muffins, yogurt and more. The possibilities are endless!